Water shortage in the Huai River Basin prompts farmers to adopt water-saving technologies such as direct-seeded nonflooded or aerobic rice. Different cultivation practices impact on tiller growth and development. Improved insight into tiller dynamics is needed to increase yield in these production systems. We conducted field experiments with four direct-seeded rice varieties under flooded and nonflooded conditions in Mengcheng county, Anhui province, in 2005-2006. The soil water content in the nonflooded treatment varied between saturation and field capacity. 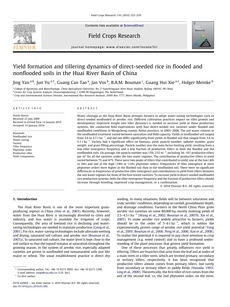 Yields in nonflooded soil ranged from 3.6 to 4.7 t ha(-1), and did not differ significantly from yields in flooded soil that ranged from 3.6 to 5.1 t ha(-1). Variety had a significant effect on biomass, yield, panicle number, spikelet number, grain weight, and grain filling percentage. Panicle number was the main factor limiting yield, resulting from a low tiller emergence frequency and a low fraction of productive tillers in both the flooded and the nonflooded soils. On average, the panicle number was 159-232 m(-2), including 34-167 productive tillers per m(2) for all the varieties under the two water regimes. The contribution of productive tillers to yield varied between 7% and 47%. There were two peaks of tillers that contributed to yield, one at the low (4th or 5th) and one at the high (10th or 11th) phytomer orders. Frequencies of tiller emergence at most phytomer orders were higher in the flooded soil than in the nonflooded soil. There were no significant differences in frequencies of productive tiller emergence and contributions to yield from tillers between the soil water regimes for three of the four tested varieties. To increase yield in direct-seeded nonflooded rice production systems, both the tiller emergence frequency and the fraction of productive tillers should increase through breeding, improved crop management, or a combination.